Francois Weil was born in Paris in 1964. When working with sculptures and stones, the most important element for Weil is movement. Sometimes monumental, his sculptures conceal a great poetic density with crossed sensitivity of his approach of materials he chooses to use such as: the mechanisms of the wheels, springs, axels or gears which agitate them. It is the role of the metal, for example, that demonstrates his state of being human, which includes a resonance and a tension towards a balance which exists only in infinite duration. 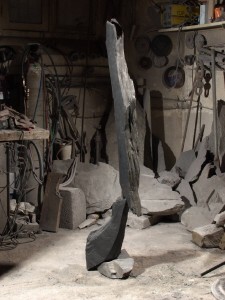 Because he works with masses and structures that are inert, he tries to create dialogue with the energy of the stone.